The confirmation comes from a 2016 paper, reexamining the results of previous sleep study from the glorious era of Y2K and Ally McBeal: the year 2000. In that study, Swiss sleep scholars (that is a thing) measured the sleep activity of 33 participants over the course of years. Measured periodically in a sleep lab, scientists gathered information on sleepers’ melatonin (a sleep-related hormone) levels, how long it took them to fall asleep, how long they remained in deep sleep, and their subjective self-reporting of feeling drowsy or well-rested the following day. But what was meant to be a general examinations of human sleep patterns provided such a robust data set, it can be reexamined for other temporal effects — including the cycles of the moon. Reexamination of the data as it relates to the cycles of the moon has demonstrated a significant phenomenon: on the 3-4 nights surrounding a full moon, participants not only took on average 5 minutes longer to fall asleep, they also slept 20 minutes less in total. Even more dramatic, their time spent in deep sleep dropped 30%, while melatonin levels lowered and self-report indicated a far higher perception of grogginess and drowse the following day. Now, while the data is significant, this retro-analysis is not without its flaws. Though the study is about as double-blind as your can get — neither the scientists nor the subjects knew what exactly they were measuring, thereby negating subconscious and/or subliminal influence) — efforts were not made to distribute the study equally across all phases of the moon. That said, the effects are statistically significant, and do merit further studies in the field. More difficult to determine is the “why” — or more appropriately, the “why’s” — of this phenomenon. The study was conducted in an indoor, dark sleep lab, where the waking effect of moonlight was negated. But much like its effects on our tides, our cycles and (possibly) our behavior, the moon still affects us from a distance. It’s possible that exposure to a full moon’s light before turning in may lead to poorer sleep. It’s even more likely that we as a species have evolved this quirk in our circadian rhythms for an adaptive reason. Were we more at risk from predators, lit by the full moon? Are we still? Further studies are necessary to determine the precise reasoning behind the moon’s effects on our sleep. But in the mean time, these effects are real, and possibly causing you real losses of energy, vitality, productivity, and some major health risks. So what can you do to fight against these effects? How can you successfully tilt against the invisible hand of a cold grey planetoid that seems to desire nothing more than your insomniatic, wakeful misery? Easy: take plenty of naps. And we’ve got the perfect solution. 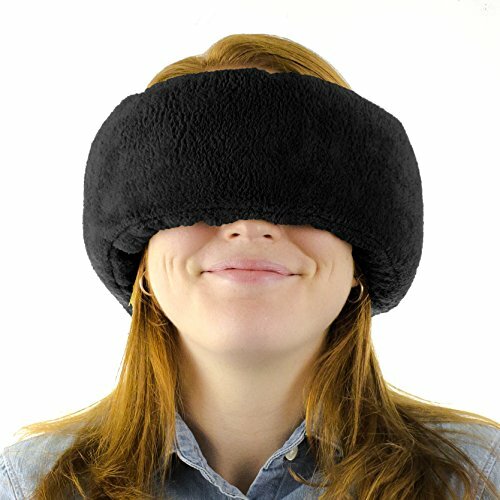 Wrap-a-Nap - Travel Pillow, Sleep Mask & Ear Muff in One. Sleep Anywhere on Airplanes, Cars, Camping, Dorm Rooms, in the Office or at Home. Ultra-Soft Neck Pillow & Reading Pillow.